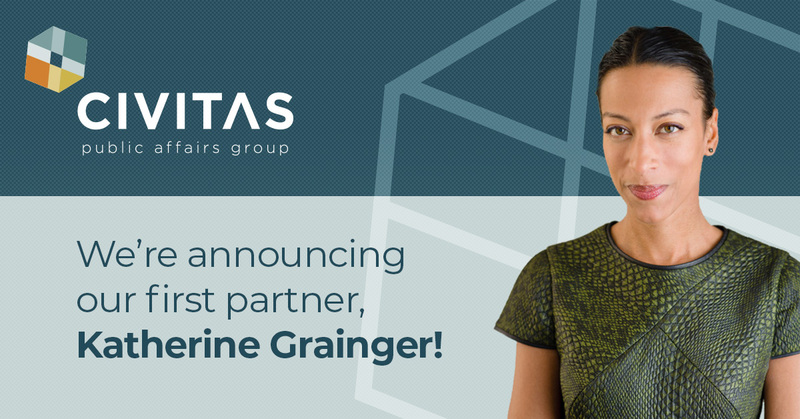 WASHINGTON, D.C. – Civitas Public Affairs Group announced today that Katherine Grainger, a sought-after strategist and national thought leader, is being promoted to partner. This is the first time the firm has named a non-founding partner. Katherine will lead Civitas alongside founding partners Bill Smith and Patrick Guerriero. Since joining Civitas seven years ago, Katherine’s legal, policy, and political expertise has contributed to real change in addressing some of the most profound and complex challenges facing our country. Through her leadership, Katherine advises the nation’s leading foundations, philanthropists, and not-for-profit organizations to create cutting-edge strategies aimed at shifting who makes the rules and holds power in this country. This includes developing strategies to increase the political power of women and people of color, creating national issue campaigns on topics such as ending the death penalty, and creatively devising new ways to use law and policy to advance civil rights protections in this country. Katherine is an expert on reproductive rights and justice and works closely with foundations and movement leaders to build bold new strategies to protect abortion access. With Katherine as partner, Civitas will continue to expand its gender justice and racial justice expertise, and grow our progressive policy and power-building platforms. We are excited about this next chapter at our firm. In addition to serving as a partner at Civitas, Katherine is an adjunct professor at the Wagner Graduate School of Public Service at New York University. While on the road more often than not, she loves being home in her beloved New York City. As a bipartisan, values-based firm, Civitas Public Affairs Group delivers winning advocacy and public affairs campaigns that touch on some of the most pressing political and public policy issues of our day. The firm has offices in Washington, New York, Denver, and Boston.